I’ve got two boys, ages 7 and 9 and everything on this list is something we already own, or that they’re getting this year. This is such a fun age because they really get to explore their interests, and they’re fun to play with too! **This post contains affiliate links, this means that if you make a purchase from the links I provide I may earn a small percentage at no additional cost to you. ** A.Suspend Game B. I survived books C. The Sign of the Beaver Audiobook D. Velcro Shoes E. Slippers F. Pom Pom Hat G. CamelBak Hydration H. Drone I. Watch Ya Mouth J. 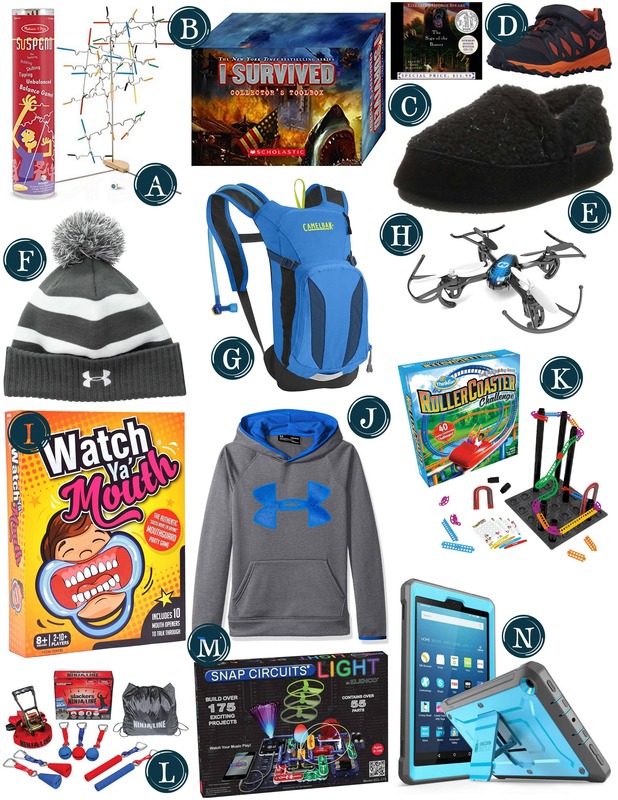 Under Armour Sweatshirt K. Roller Coaster Building Set Pack L. Ninja Warrior Set M. Snap Circuits N. Kindle Fire & Kindle Case Other Ideas: Trampoline Park Gift Certificate, Zoo Passes, Museum Gift Certificate, Cooking Classes, Arcade Gift Card. A.Suspend Game– This is a balancing game, almost like a new twist on Jenga. I think our entire family will enjoy playing this. B. I survived books– Both boys love reading these I survived books. They would go nuts for an entire box set! C. The Sign of the Beaver Audiobook We just finished listening to this audio book and we all loved it! It was super entertaining and I’m sure we will listen to it again. D. Velcro Shoes– These shoes are our favorite. They don’t look like toddler shoes, but also don’t have any laces to deal with. E. Slippers– Acorn slippers are on everyone’s list this year. They’re definitely a family favorite. F. Pom Pom Hat– My boys are just starting to care about the brands that they’re wearing, and Under Armour is at the top of their list. They also currently love pom pom hats. H. Drone– We bought a drone and about five minutes later lost it in the woods, so this is at the top of my boys list. This time I think we’ll help and supervise better so that this one isn’t a goner too! I. Watch Ya Mouth– This might be our favorite game to play as a family. There’s lOTS of laughing and fun every time we play. J. Under Armour Sweatshirt– Again, Under Armour=Cool in my boys’ book. They also love to be comfortable so these are perfect. K. Roller Coaster Building Set Pack– I got to test this at a local toy store and it’s really cool. My boys have been designing roller coasters on paper so getting to build one in 3d will be really neat for them. L. Ninja Warrior Set– We’re big ninja warrior fans so setting up obstacles in the backyard is something the boys would love. M. Snap Circuits– My nine year old got this set for his birthday and plays with it daily. It’s super cool watching him figure out how electricity works. N. Kindle Fire & Kindle Case– My kids have had kindles with these cases for a few years now and we love them. They’re WAY cheaper than ipads and still have tons of great games and apps.